Healthy hair needs proper care. This hairbrush offers a ionic diffuser that can be activated depending on your wish. Ions are delivered around each hair and static electricity is eliminated. 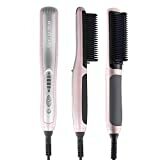 This enables you to comb your hair easier and soft protective pads are gentle for your hair. For easier cleaning, you can remove the insert. In addition you can enjoy with the additional vibration massage function. Note: Batteries are not included in delivery. 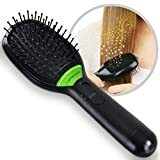 Ionic Hair Brush by American Dream Ionic Brush Leaves hair feeling super soft and smooth Easy hold handle Comfortable grip Long lasting and hard wearing.